Custom designed for your precious Garmin Fenix 5, 5S, 5X, Forerunner 935, Vivoactive 3, Approach S60, X10, X40, D2 Charlie, Quatix 5, 5 Sapphire Smart Watch. ☞The dust plug can prevent your device from being affected by the dust and sweat, therefore, they also can protect the inner parts of your watch to some degree. ☞Good tactility, feeling smooth as well as soft. The cables feel fine and its slightly softer than a normal cable. ☞ It is portable and convenient to place it in your bag, drawer or anywhere. NOTE: Don't use your watch while charging. 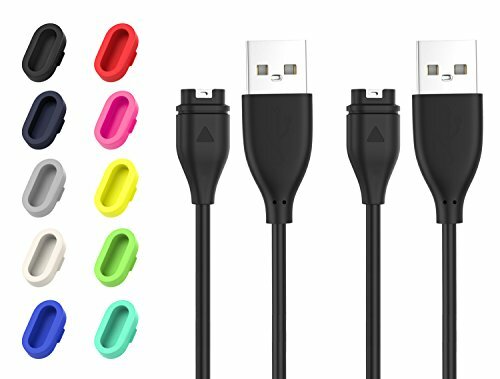 Personalized your Garmin Fenix 5, 5S, 5X, Forerunner 935, Vivoactive 3, Approach S60, X10, X40, D2 Charlie, Quatix 5, 5 Sapphire smart watch with this refined dust plugs and charging cable to protect the precious device from dust and keep it clear. The dust plug is made of safe and harmless silicone with smooth surface for a sporty look, will not damage smart watch, and have excellent durability. And the cable is made of high quality ABS, is anti-pulling and won't be easily break, strengthened the cable and joint. The cable and dust plug are small and easy to accommodate, portable and convenient to bring it in your bag. The adapter cable and dust plug are environmentally friendly, nontoxic. The cable with the characteristic of constant temperature, does not need the temperature-controlling system. Very easy to be installed on charging port and will stay firmly and convenient to remove from it as well.